I have a receipt for extended warranty which while faded was just readable enough for the shop assistant to copy. The company in question refused to honour it and requested the physical receipt which was duly sent. After it was refused again I requested the receipt to be returned to me, the problem is that it is now more or less blank which renders it unreadable. Is it possible for the fading to be accelerated? 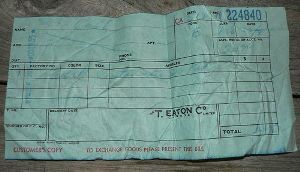 Is it possible to forensically enhance the receipt?